The deeper I get into these last frantic weeks in Los Angeles, the more I crave my food easy, comforting and featuring at least one or two go-to ingredients already on hand, not just because they simplify my life, but because they assure me of some success. Pasta usually fits all three bills. Cruising along the Italian offerings here, I stumbled upon something called the Puglia Lady’s pasta, and noticed it was a recipe written by my friend and colleague fisheri. I emailed him to tell him I was going to give a whirl, and thus ensued a cross-country culinary meltdown that I doubt even Gen. Petraeus could contain. The recipe doesn’t work in America, fisheri insisted. The ingredients are not the same here as they are in Italy, from whence the recipe sprang! You can’t possibly cook it! Adjustments must be made! Um ok, I replied, maybe you should fix it. Like now. He started to say something about having a job or something and then I begged and pleaded and maybe made some sort of vaguely menacing comments, I don’t really remember, but anyway he tinkered away and posted the result, which is the very, very fine Puglia Lady Rethought for America. At first blush this seems like a few broccoli rabe bunches tossed into some pasta, end of story. But all the tiny touches -– anchovies, red wine vinegar and red pepper flakes, which he refers to as peperoncino –- more than compensate for what fisheri claims are the inadequacies of American vegetables, and make the dish both rich and bright, especially when topped with some good black pepper and parmesan cheese. The key to this recipe, as its author implores throughout, is not time or really steps, but a watchful eye. Overcooked broccoli rabe would more or less ruin this dish. 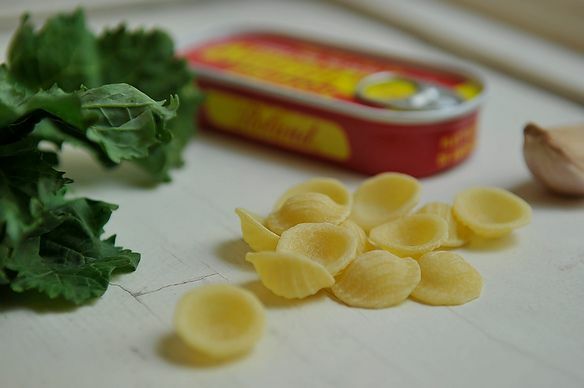 Further, there is a very fine line between undercooked orecchiette and pure pasta mush that shreds under a fork unpleasantly. So if someone stands next to your stove blathering on about their private school applications or tries to engage you on the inherent outrages of stopping a soccer goal with one’s hand, smile gently and shoo them away. ATTENTION I SAY! And then, it is all divinity on the plate, as my four guests attested while they cleaned their plates. So what we have here is a lesson, friends. What works in Rome -– or even in southern California in say, February –- is not always going to come together perfectly on the stove 6,000 miles away, where ingredients are different, even subtly so. But while we can’t all be as talented at fisheri at fixing recipes, this one underscores that it is always worth a try. Remove most of the stems from rabe. Cut greens into 2 or 3 inch pieces. Boil and salt water. Blanch the greens for five minutes or so. Drain and set aside. Bring a large pot of salted water to a boil. Heat three tablespoons of olive oil over medium heat. Add chopped garlic and anchovies, along with a good pinch of peperoncino. Saute three minutes or so, until anchovies are dissolved. Add rabe, stir and saute about 5 minutes so it soaks up the oil. Add a bit of salt. Add chicken broth and vinegar and saute, stirring as needed, till the rabe is tender but by no means mushy. There should be a bit of tasty liquid but not too much. Boil orecchiete in salted water, watching like a hawk that it doesn't overcook. I recently bought very good orecchiette that was ready three minutes before the recommended cooking time. Drain pasta when done. Combine pasta and rabe over medium heat for a minute or two. Check for salt. A bit of oil will not hurt. Serve with a generous grating of parmigiano, a drizzle of oil, black pepper and a little fine sea salt. I was lucky enough to be a 'guinea pig' for this recipe. It was totally delicious. Comforting, savory, simple and sophisticated all at once. Divinity on a plate indeed, notwithstanding ktichen blathering . . . It must be so crazy to be moving from one coast to the other in the middle of the summer--fortunately you have a bunch of DC-area Food52ers to help with the transition. Good luck, and thanks for continuing your writing for Food 52. I look forward to it every week. Love this! I will make it when the heat wave has passed. But I'm cooking my rabe legs (they're good!) Trim bottoms and peel tough stems. Cook stems a couple minutes, then add rest of greens is how my mom taught me. I am glad you added this comment because I felt sad and wasteful discarding all that "stem" as I would not with regular broccoli. I will try your legs method the next time I make this dish, which will be soon because I've got this weird hankering for it now.